The 1952 United States House of Representatives elections was an election for the United States House of Representatives in 1952 which coincided with the election of President Dwight Eisenhower. 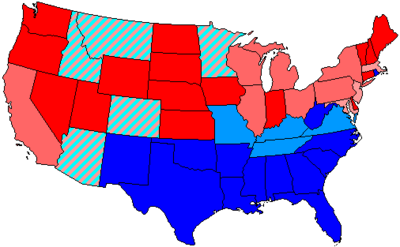 Eisenhower's Republican Party gained 22 seats from the Democratic Party, gaining a majority of the House. However, the Democrats technically had almost 250,000 more votes (0.4%). This would be the last time the Republican Party won a majority in the House until 1994. It was also the last election when both major parties increased their share of the popular vote simultaneously, largely due to the disintegration of the American Labor Party and other third parties. Finally, it would be the last time either party gained new control of the House of Representatives, coinciding with a presidential election. Outgoing President Harry Truman's dismal approval rating was one reason why his party lost its House majority. Also, continued uneasiness about the Korean War was an important factor. Joseph W. Martin Jr. (R-Massachusetts) became Speaker of the House, exchanging places with Sam Rayburn (D-Texas), who became the new Minority Leader. Notable freshmen included future Speaker Tip O'Neill (D-Mass. ), future Senate Majority leader Robert Byrd (D-W.Va.), future Secretary of Defense Melvin Laird (R-Wisc. ), future House Majority Leader John Jacob Rhodes, and future Senators Thomas J. Dodd, Lee Metcalf, and Roman Hruska. Four special elections were held on dates other than in November. New York 5 T. Vincent Quinn Democratic [Data unknown/missing.] Resigned December 30, 1951. New member elected February 19, 1952. New York 32 William T. Byrne Democratic [Data unknown/missing.] Incumbent died January 27, 1952. New member elected April 1, 1952. Kentucky 2 John A. Whitaker Democratic [Data unknown/missing.] Incumbent died December 15, 1951. New member elected August 2, 1952. Texas 7 Tom Pickett Democratic [Data unknown/missing.] Incumbent resigned June 30, 1952. New member elected September 23, 1952. Arkansas lost one seat in reapportionment leaving it with 6; the existing 4th district along the western edge of the state lost some of its territory to the 3rd district in the northwest, and the rest was merged with the 7th district in the south, with minor changes to other districts. Seven new seats were added in reapportionment, increasing the delegation from 23 to 30 seats. Two of the new seats were won by Democrats, and five by Republicans. One Republican and one Democratic incumbents lost re-election, and a retiring Democrat was replaced by a Republican. Overall, therefore, Democrats gained one seat and Republicans gained 7. Florida was redistricted from 6 districts to 8, splitting the area around Sarasota out from the Tampa-St. Petersburg based 1st district, and splitting Gainesville out from the Jacksonville-based 2nd district. Illinois lost one seat, redistricting from 26 to 25 districts. No changes were made to the Chicago area districts, but the downstate districts were broadly reorganized, forcing incumbents Peter F. Mack Jr. (D) and Edward H. Jenison (R) into the same district. Kentucky lost one seat at reapportionment, and redistricted from 9 districts to 8, adjusting boundaries across the state and dividing the old 8th up among its neighbors. Maryland redistricted from 6 to 7 seats, transferring territory from the 2nd to the 3rd and 4th and to a new 7th seat in the Baltimore suburbs. Michigan added one seat, and divided the 17th district to form an 18th district, leaving boundaries otherwise unchanged. Mississippi lost 1 seat in reapportionment and redistricted from 7 seats to 6; in addition to other boundary adjustments a substantial portion of the old 4th district was moved into the 1st, and 4th district incumbent Abernethy defeated 1st district incumbent Rankin in the Democratic primary. New York redistricted from 45 seats to 43, losing a seat in Long Island and another upstate. New York 16 Adam Clayton Powell Jr.
Ohio's representation was not changed at reapportionment, but redistricted its at-large district into a 23rd district and also removed the 11th district in south Ohio, creating two new districts around Cleveland. Oklahoma was reapportioned from 8 seats to 6 and eliminated the 7th and 8th districts, moving most of their territory into the 1st and 6th and expanding other districts to compensate. Pennsylvania redistricted from 33 districts to 30, eliminating 1 district in northeastern Pennsylvania and 2 in southwestern Pennsylvania. Pennsylvania 13 Samuel K. McConnell Jr.
Tennessee lost one seat in reapportionment, and divided the old 4th district between the old 5th and 7th districts, with other minor boundary changes. Texas gained one seat, adding it as an at-large district instead of redistricting. Virginia gained one seat, adding a new district in the DC suburbs and making boundary adjustments elsewhere. Washington gained one seat at reapportionment, adding it as an at-large district instead of redistricting. ^ a b c d e f g h i Martis, Kenneth C. (1982). The Historical Atlas of United States Congressional Districts, 1789-1983. The Free Press. ISBN 0-02-920150-0.